The Coach Zebra Frame Wristlet is a from the latest release of Coach Designer wallets.. 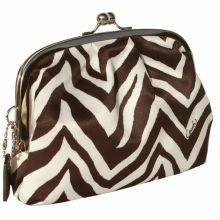 It features satin zebra fabric design, kiss lock closure, with a internal slot. This wristlet would make a great gift idea.